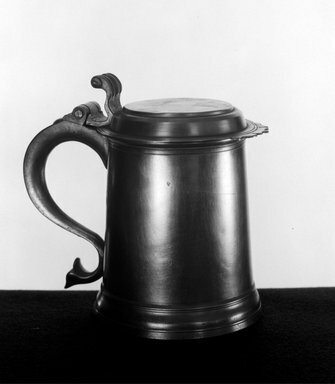 Large pewter tankard with hinged lid. Cylindrical body is banded around foot and tapers as it rises to banded top edge. Attached handle in shape of truncated "S" with short tail end terminating in a flared shape. Flat-domed lid fits over mouth of tankard, has flat, projecting rim with crenate edge in section opposite handle. Lid hinged to top of handle by thumb piece with grooved, scrolled end. CONDITION: Good; light scratches, pit marks, and spots of discoloration all over; large dent in bottom of tankard; smaller dents or dings around body and on top of lid.